Indianapolis Republican mayor wants “religious freedom” law repealed. Indianapolis Mayor Greg Ballard speaks about Indiana’s controversial Religious Freedom Restoration Act on March 30, 2015. 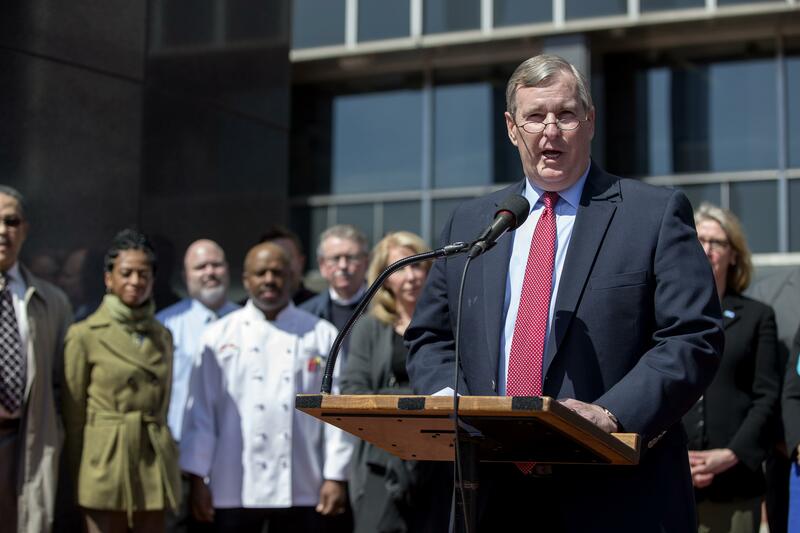 Indianapolis Mayor Greg Ballard reiterated his opposition to Indiana’s recently passed Religious Freedom Restoration Act on Monday and went one step farther calling for the repeal of the measure that was signed into law last week by Indiana Gov. Mike Pence, if explicit protections for sexual orientation aren’t included. The Republican mayor of the state’s capital city, and host of this week’s Final Four, also issued an executive order “that anyone who receives money from the city government must abide by its human rights ordinance, which has had [sexual orientation and gender identity] protections in place for a decade,” the Indianapolis Star reports. The RFRA law allows for religious conservatives to refuse to serve gay individuals if it conflicts with their religious beliefs on homosexuality. “Although the law is similar to a federal one and those in 19 other states, sexual orientation is not a protected class in Indiana, leaving the door open for discrimination, critics say,” according to NPR. Since Pence signed the bill, the state has faced an avalanche of criticism, and is facing potential boycotts. On Monday, “flanked by business leaders, Ballard denounced the law not only as a threat to the city’s economic interests, but as a serious concern for residents and visitors who fear that they could be subjected to discrimination for religious reasons,” according to the Indy Star. “The backlash has come fast and furious, with publicly traded companies such as Angie’s List and Salesforce threatening to reduce their investment in the city, and celebrities such as George Takei and Charles Barkley calling for a boycott of Indiana.” The rock band Wilco also announced on Monday it is cancelling an upcoming concert in the state in protest of the new law.